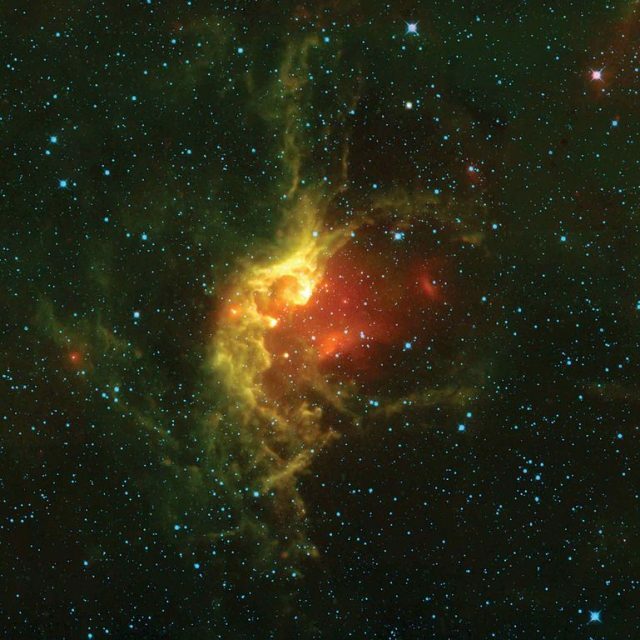 The Wizard Nebula is an emission nebula that surrounds the open star cluster NGC 7380 in the constellation Cepheus. The nebula is known for its unique shape, resembling the appearance of a medieval sorcerer. The active star forming region lies at a distance of 7,200 light years from Earth and has an apparent magnitude of 7.2. 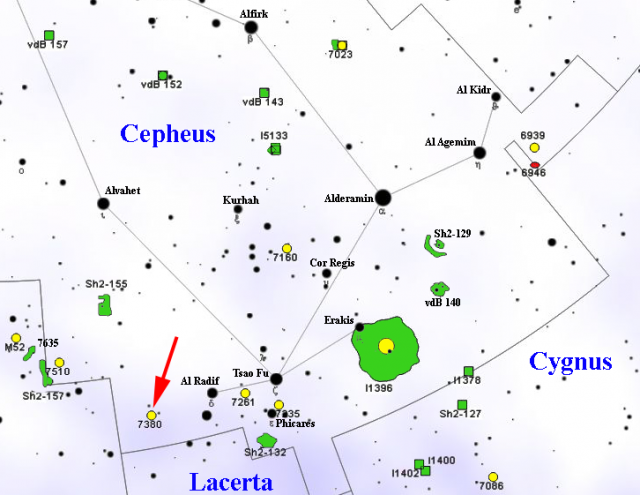 It has a radius of 100 light years and occupies 25 arc minutes of the apparent sky. It has the designation Sh2-142 in the Sharpless catalog of H II regions. The open cluster NGC 7380 was discovered by the German astronomer Caroline Herschel in 1787. Her brother William Herschel included it in his catalogue as H VIII.77. The estimated age of the cluster is 4 million years. The radiation and stellar winds of the cluster’s young stars are responsible for creating the nebula’s shape. 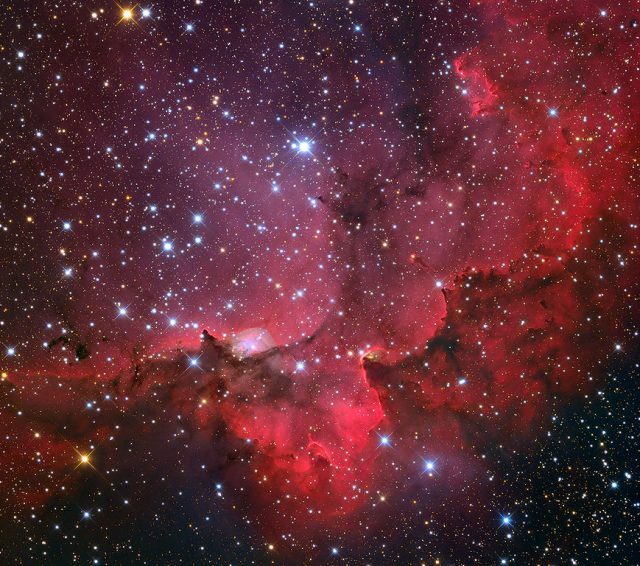 The ultraviolet light from the luminous type O and B stars formed within the molecular cloud ionizes the nebula’s hydrogen, which in turn re-emits light in the red part of the spectrum. While the nebula will dissipate within a few million years, some of the stars formed within it will likely outlive our Sun. 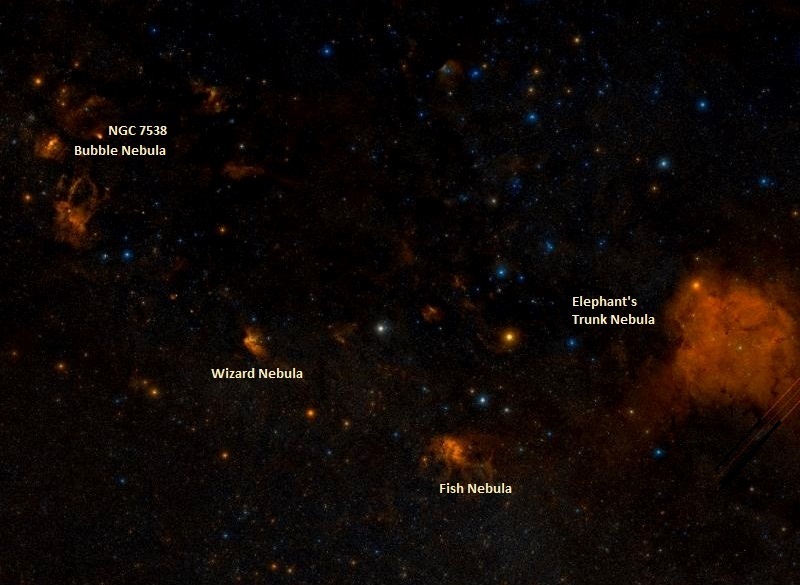 Before it disappears, the nebula will produce many more stars. 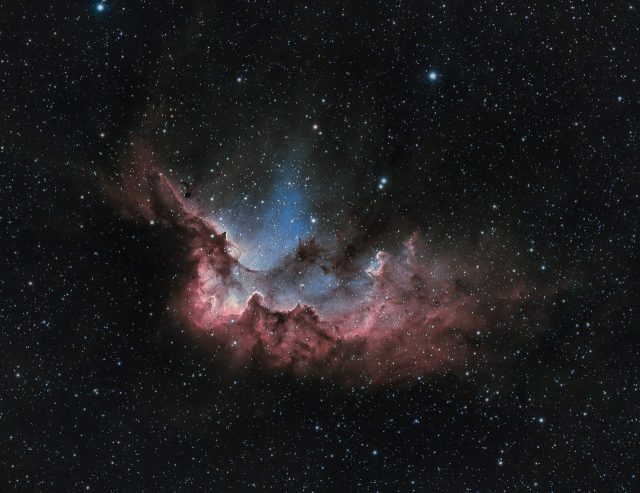 Despite being fairly large, the Wizard Nebula is a challenging object to observe and requires an OIII filter and extremely clear, dark skies. It can be seen in a small telescope. Visually, the nebula’s size is comparable to that of the Moon. 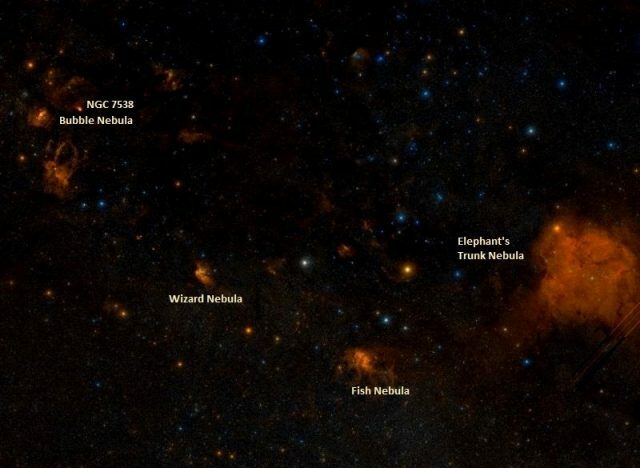 The Wizard Nebula lies in the same region of the sky as the Iris Nebula (NGC 7023), Cave Nebula (Sharpless 155), the star forming region NGC 7822, Elephant’s Trunk Nebula (IC 1396A), the H II region Sharpless 132, sometimes known as the Fish Nebula, and the emission and reflection nebula NGC 7538 in Cepheus, and is also relatively close to the famous Bubble Nebula (NGC 7635) in the neighbouring Cassiopeia.